I was first introduced to hummus while working in Saudi Arabia. The cafeteria cooks on the Saudi Aramco compound made some really excellent hummus. The color was almost like alabaster and the texture was very smooth. The local pita was very thin, and we would take a torn piece between the thumb and index finger and pinch up the creamy hummus. Party fare always included hummus, and I asked the other teachers how to make it. The answer was almost always the same: garbanzo beans, lemon juice, garlic, tahini. No amounts included. So I started experimenting and reading many different recipes for hummus, and after many experimental versions I finally hit the nail on the head. When I taste it I can close my eyes and imagine that I’m back in Saudi Arabia—it’s that close to the stuff I remember. I’ve made hummus a regular part of our diet at home. As toddlers, my boys first tasted hummus on their morning toast. We like it with pita or as a spread inside a sandwich wrap. I usually buy the Trader Joe’s Apocryphal Pita for dipping. This recipe is for a basic traditional hummus using canned garbanzos, but I also included a variation starting from dried garbanzos. If you like to experiment, try this recipe with roasted garlic or peppers, dill, sun-dried tomatoes, or chopped calamata olives. Have fun with it, and let me know if you find any variations that you really like. Press beans through the food mill to remove the skins. Add a couple tablespoons of olive oil as necessary to fully remove the skins. Pour the beans into the bowl of the food processor. Add tahini, lemon juice, and garlic. Process on low until thick and smooth, drizzling the olive oil in slowly. Adjust flavor with additional lemon juice as desired. Add salt to taste and finish processing. Spread into a shallow serving dish. Garnish with a swirl of olive oil, parsley, and a sprinkle of paprika. Do you think I could use just a blender instead of a food mill and processor? Yes, you could, although it will not remove the skins. It’s a different texture, though still good. I’ve tried blender vs food processor, and found that the blender tends to hit “pockets” of air in the mixture and whir without actually doing anything except burning up the motor. To avoid that, you may want to start with half the beans (or less) and all of the lemon juice in the bottom of the blender, then slowly add the rest. The extra liquid seems to help keep the blender blade moving. 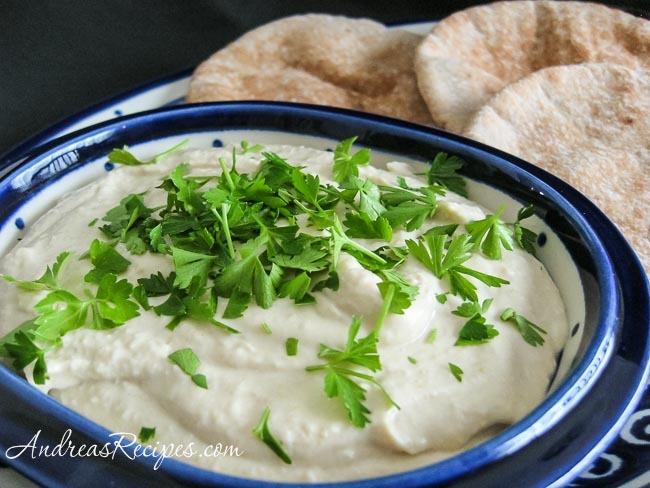 I want to try this – I love Hummus and was always curious how to make it – thanks! This recipe is awesome, great flavor for such little work. My husband and son love it!!! Thanks for posting this recipe. Jennifer, glad to hear that your family enjoyed it! And thanks for reminding me that I hadn’t made a batch since we moved. I whipped some up yesterday afternoon. Ooo….will it really taste like the hummus from the Middle East. I so miss the smooth stuff we got in Qatar. you just can’t find it here, Lebanese Taverna comes the closest, but the Whole Food Garlic is also the closest store-brand stuff I’ve found…maybe I’ll give this a try. thanks for sharing this recipe, it is great, very nice variation of the recipe. In the last part where you describe on how to proceed if using DRIED garbanzo beans, you have omitted the actual cooking part 🙂 Soaking for 12 hours alone without boiling the beans will not do it. You might want to correct that before someone tries it literally and blames you for a ‘bad’ recipe.